Retrocalcaneal bursitis is a painful inflammation of the soft tissues at the attachment of the Achilles tendon to the back of the heel bone. 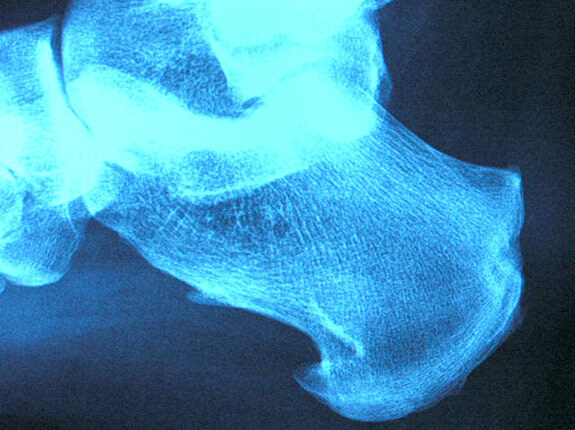 The retrocalcaneus identifies the “retro” or behind and “calcaneus” or heel bone. Bursitis relates to inflammation of a bursa in the retrocalcaneal region. A bursa anatomically is a fluid filled sack that is located around tendinous attachments in the body. The retrocalcaneal bursa as identified in the photo 1 protects the Achilles tendon just prior to its insertion to the retrocalcaneal region. The retrocalcaneal bursa cushions the Achilles tendon and normally allows pain free motion of the Achilles tendon over the calcaneus. Occasionally the bursal sac can become inflamed and painful. Pain to the region is worse typically with initial weight bearing activity such as rising from bed in the morning. Swelling and warmth to the region are common. Clinical examination shows pain to palpation at the retrocalcaneus at a level just before the Achilles tendon. Increase pressure and friction of the Achilles tendon across the retrocalcaneal region is the cause of this bursitis. A high arch, tight Achilles tendon or bone spur appear to be some of the main causes of this problem. With a high arch the back portion of the calcaneus abnormally projects into the Achilles tendon region as noted in the x-ray. This increase pitch of the calcaneus places increase load and pressure on the bursa directed from the Achilles tendon while lifting the heel during normal walking. A tight calf muscle will increase the amount of pressure and friction to the bursa as the heel is lifted off the ground during normal walking activity. Bone spurring to the retrocalcaneal region including the Achilles tendon at its attachment level can increase the pressure and friction within the bursa also helping to contribute this foot pain. Treatment consists of anti-inflammatory therapy with the use of ice, short term non steroidal therapy including ibuprofen and naproxen and selective use of cortisone injections. Cortisone injections have been shown to be a highly effective anti-inflammatory measure for relieving foot and ankle pain. Care must always be taken by the physician to insure that the injection is administered into the bursal sac and not the Achilles tendon which can cause tendon injury. 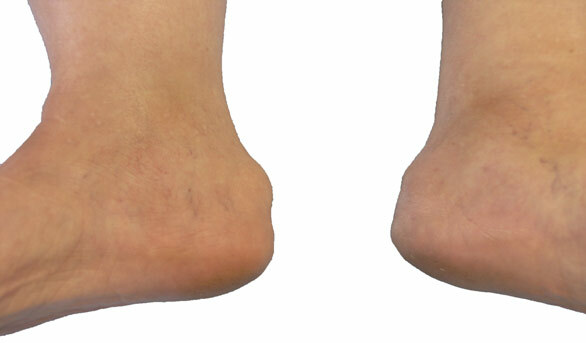 Treatment also consists of the use of heel lifts or the temporary use of a shoe with a low heel. The heel lift decreases the mechanical load on the Achilles tendon. Gentle stretching of the Achilles tendon, the possible use of a splint that is worn at night as well as physical therapy as directed by your physician can be employed. Temporary activity limitations for fitness must be incorporated into the treatment plan. Any weight bearing activity for exercise that actively lifts your heel off of the ground including running, walking stair stepper will interfere with effective conservative care. Low impact activity including biking and pool tend to be safe exercises during your recovery. Pain relief is most commonly obtained conservatively but in some instances surgical repair will be required. 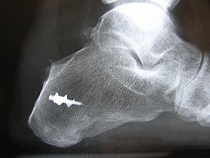 Surgical reconstruction entails removal the bone spurring as well as a portion of the calcaneus as shown in the photo below. To accomplish this a small portion of the calcaneus is surgically removed with reattachment of the Achilles tendon down to the heel bone with a surgical bone anchor. 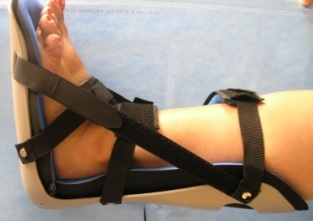 After surgical repair a short period of non weight bearing followed by the use of a removable walking cast prior to transition back into regular shoes is employed. Recovery from most surgery is complete with regard to return to normal activity within three months. Surgery to the retrocalcaneal region often times creates recovery periods that are closer to four to six months. At this time most patients should be performing their normal life activity with minimal compromise. The effective use of physical therapy modalities, anti inflammatory medications and activity modification during the recovery period generally provides a successful conservative outcome with the avoidance of surgical care. Clinical anatomy of the retrocalcaneal bursa. Lower leg overuse injuries in athletes. Surgery for retrocalcaneal bursitis: a tendon-splitting versus a lateral approach. * Pro-Stretch stretches the foot in the proper position to relieve plantar fasciitis, heel spurs and heel pain, calf muscle pain, and Achilles tendonitis. Night splints have been clinically demonstrated to reduce the symptoms of Plantar fasciitis,heel spurs, Achilles tendonitis, and drop foot.